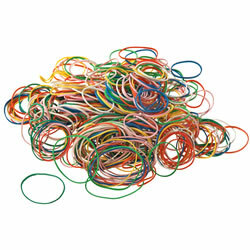 Let students explore basic geometric concepts with safe and colorful elastic bands and plastic pegs. Students can also further their understanding of area, volume, and perimeters with Kaplan's selection of folding geometric shapes. Kaplan also offers activity sets mosaics to promote patterning and problem solving skills. Teach shapes, angles, sets, measurement, number patterns, and abstract mathematical concepts. 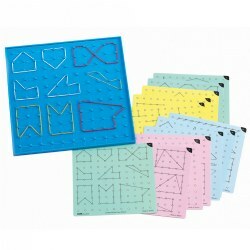 Great for use with the Geoboards. Grades K - 3. Explore geometric relationships with intricate designs. Durable, 7" geoboards have 5" x 5" grids with raised edges to protect pegs. 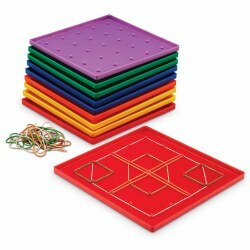 Includes 10 GeoBoards with rubber bands. Grades K & up. Durable plastic cards illustrate ideas for hands-on experience with parallel and perpendicular lines, geometric shapes, area, perimeter, angles, symmetry, and irregular shapes. Includes 12 cards with 24 activities. Geoboard is sold separately (item #13183 and #53373). Grades 2 & up. Great way to explore area, volume and perimeter with this 16 piece set of geometric shapes. 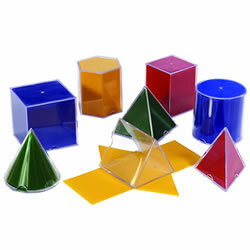 Shapes are 3 inches high and the set consists of eight transparent shapes and eight folding shapes. Children will love to see how much one shape will hold and then compare to another shape.